1. Break up the chocolate into pieces and melt in a heatproof bowl placed over a pan of simmering water. 2. Meanwhile, whisk the egg whites until they reach soft peaks. While still whisking, gradually add the sugar 1 tbsp at a time until incorporated and the whites are stiff and glossy. 3. Remove the chocolate from the heat and beat in one-third of the egg whites. 4. Now gently fold through the remaining two-thirds being careful not to beat the air from the mix. Add the brandy and work in until you reach a smooth mixture. 5. Divide the mixture between 4 serving glasses and cool in the fridge for 2 hours. 6. 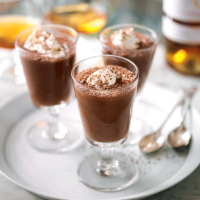 When ready to serve, whip up the double cream and spoon a little mound atop each mousse. Finish with a dusting of grated dark chocolate over the top and serve with the shortbread fingers.